Here’s a great way to experience humor that doesn’t require you to go anywhere or do anything other than relax and… remember a past humorous memory or Moment of Mirth. 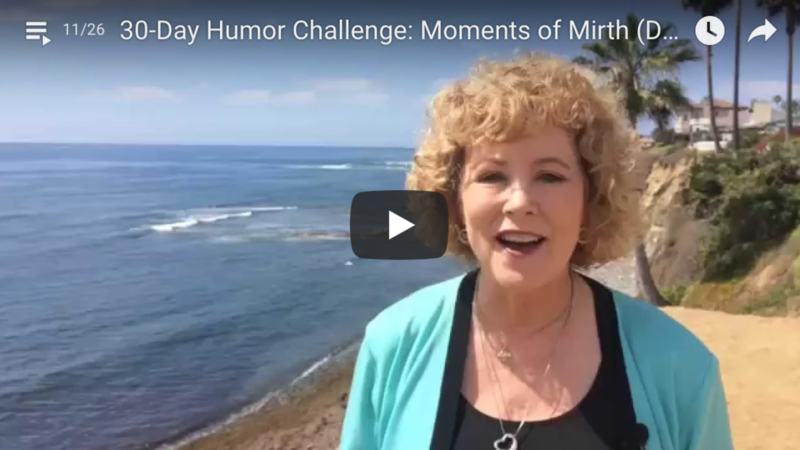 Today's humor challenge: Moments of Mirth. We’ve all got stories that we share when we get together with friends or family—usually preceded by “Remember the time when…?” These stories usually grow and get even funnier over time. Recalling humorous events can be just as entertaining (maybe even more!) than when you actually experienced them the first time. Recalling funny stories can provide physiological benefits like muscle relaxation. This can provide psychological benefits like decreased anxiety or depression. And you can even experience social benefits when you share these stories with others. So that’s today’s challenge: Reminisce for a bit. Tap into a Moment Of Mirth. Write it down. And then to get even more mileage out of it, reach out to someone today and share it. You’ll both benefit! That’s it! Congratulations for committing to another day. I hope you’ll join me tomorrow for the next humor challenge. I’m Karyn Buxman reminding you to create a humor habit and reap the benefits. Humor is power! Neurohumorist Karyn Buxman’s mission in life is to enhance global business, improve global health, and achieve global peace through strategic humor.